I put up the Christmas tree today. It always seems to be the last part of Christmas that I get assembled. 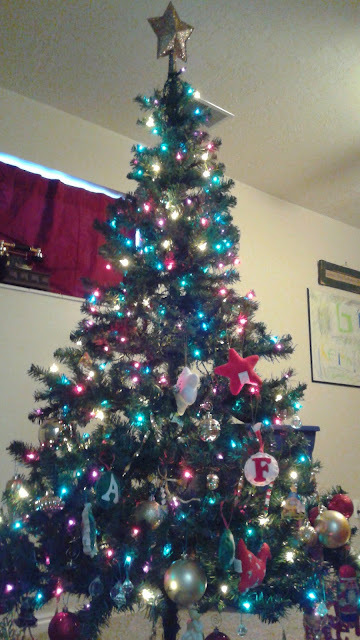 But I got it up, and then I let the three year old girls have at it. They had SO much fun decorating it, and I had even more fun watching them! First I explained to them the importance of not putting the ornaments all in one spot or the tree might get too heavy there and tip over. I tried to help them understand that they would need to space them out, and try to put them all over the place. They both rolled their eyes, and told me they knew it already. And they really thought they did. They went at it with gusto! 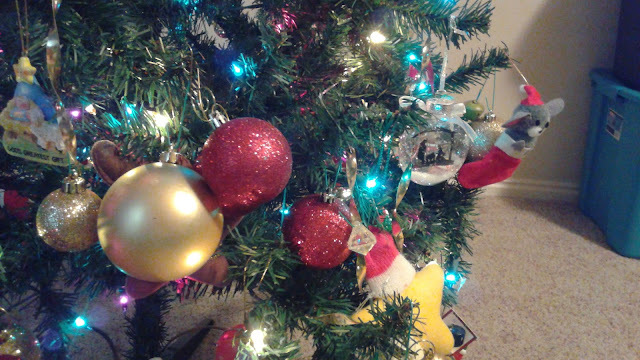 When we first started, they would stand back, appraising the tree with the ornament in their hands. Beth would walk around the tree, slowly, with a careful eye, trying to gauge best where to put the next ornament. She would put it lovingly onto the branches, and step back and admire her work before rushing back to me and the pile of ornaments that I was detangling. 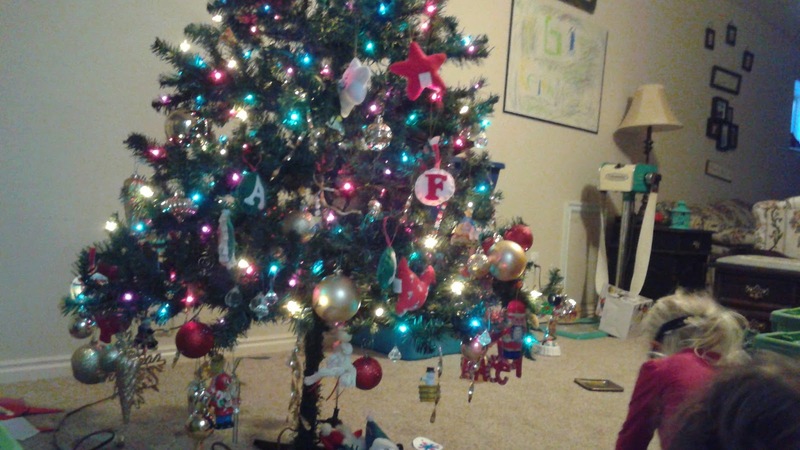 Taelynn would follow Beth around the tree, impatiently, waiting for her to place her ornament, so she could put hers right next to Beth's. And when I say right next to, I am talking same branch, same spot. They did this for a little while, and then Taelynn got tired of waiting for Beth. She went around systematically filling up each branch on the bottom level. Putting as many ornaments on each branch that she could fit. I was in fits of laughter watching them! When Keith and Faye got home, I told them they would need to fix the tree. Which of course, was the greatest thing to hear upon entering the house after school! I haven't been down to see it yet, but I am sure it looks a lot better. I don't really care what the Christmas tree looks like, honestly. The kids have fun decorating and re-decorating it all season long, and I figure that is sort of the point of it, right? I mean, why have a tree that they can't touch or take pride in? It all started our first Christmas here. I was trying to get unpacked, and we only had 4 days before Christmas when we moved in, so I told the kids to have at it. And then the next year I miscarried and we were trying to get Jeffrey to finish the semester and were crazy stressed over getting his thesis in, so I didn't feel like/have time to decorate the tree so they once again had free reign. And then last year I was sick because I was pregnant (and hadn't heard of Plexus yet), so it has sort of become a tradition for them, and it is something they look forward to. And I love that it is one of the many things on my list that I don't have to do anymore! I just have to put it up and take it down. It is pre-lit, and I thank the wonderful person who came up with that concept! One step closer to the big night! Now for the dreaded gift wrapping. If only I could get them to do that as well. Smigh.